Then there was the Haunted Tank. I love the idea of the Haunted Tank. Lt. Jeb Stuart, the namesake of the famous Confederate cavalry general, becomes commander of a Stuart tank (also named after the general.) 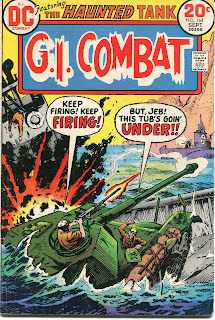 He then discovers that his tank is actually haunted by General Stuart, who appears only to Jeb to deliver cryptic advice. Jeb then inevitably figures out the advice in the nick of time to save his tank and accomplish his mission. 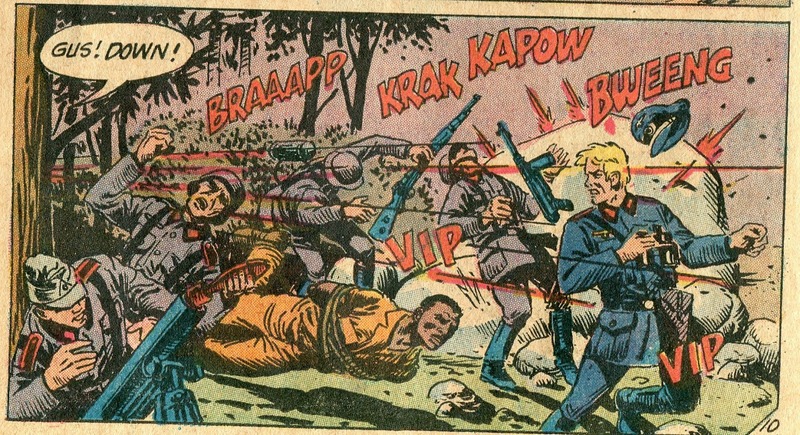 In early Haunted Tank stories, Kanigher never infused the characters with the same level of personality he had managed with Sgt. Rock. 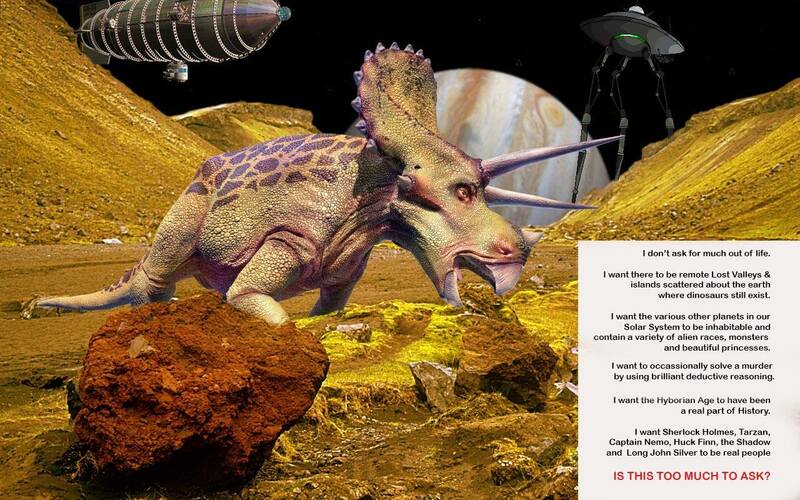 Jeb’s three crewmates, Arch, Rick and Slim, were pretty much ciphers with nothing beyond their names to individualize them. The stories are still good, though. 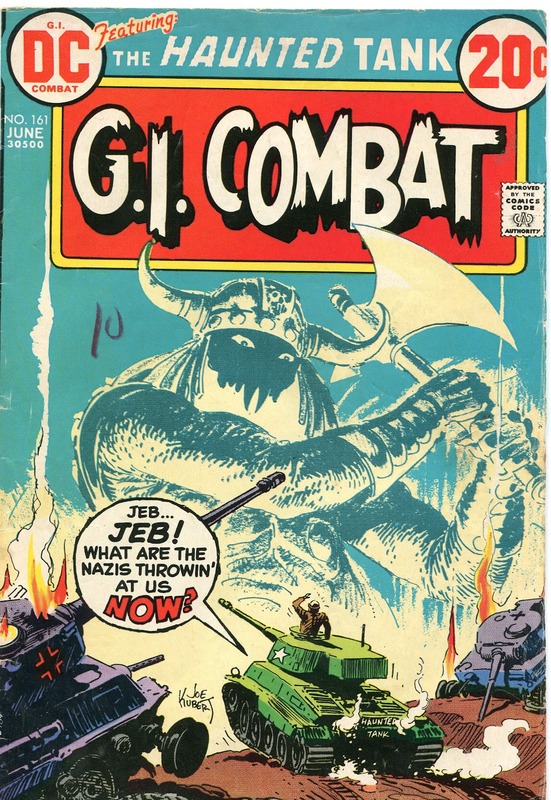 Jeb was likable enough and the art usually by Joe Kubert or Russ Heath was superb. 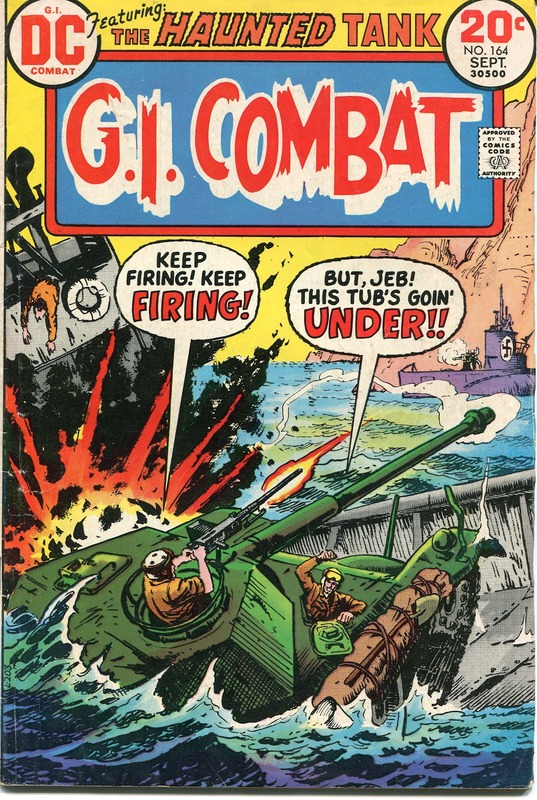 Often the stories seemed to be deliberately structured to showcase the art—one early issue has Jeb taking his tank up a pile of rubble to the second floor of a bombed out building, where he then picked off a Tiger Tank from above. 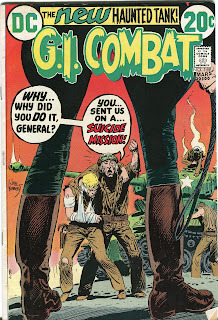 Not terribly realistic, but Joe Kubert made it look too cool for school. 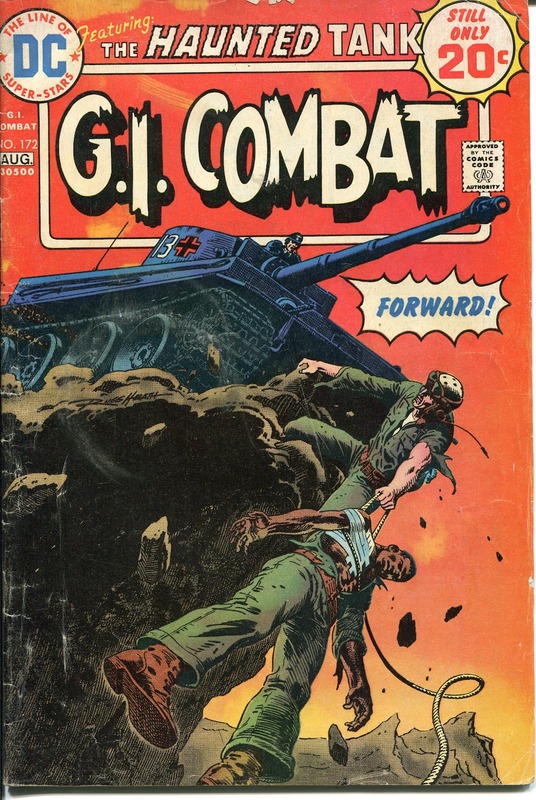 Around 1973, Archie Goodwin became editor of the DC war comics and began to feature multi-issue story arcs. I’ve written in the past about the Sgt. Rock and Losers stories. This time around, we’ll see what the Haunted Tank was up to during this time. 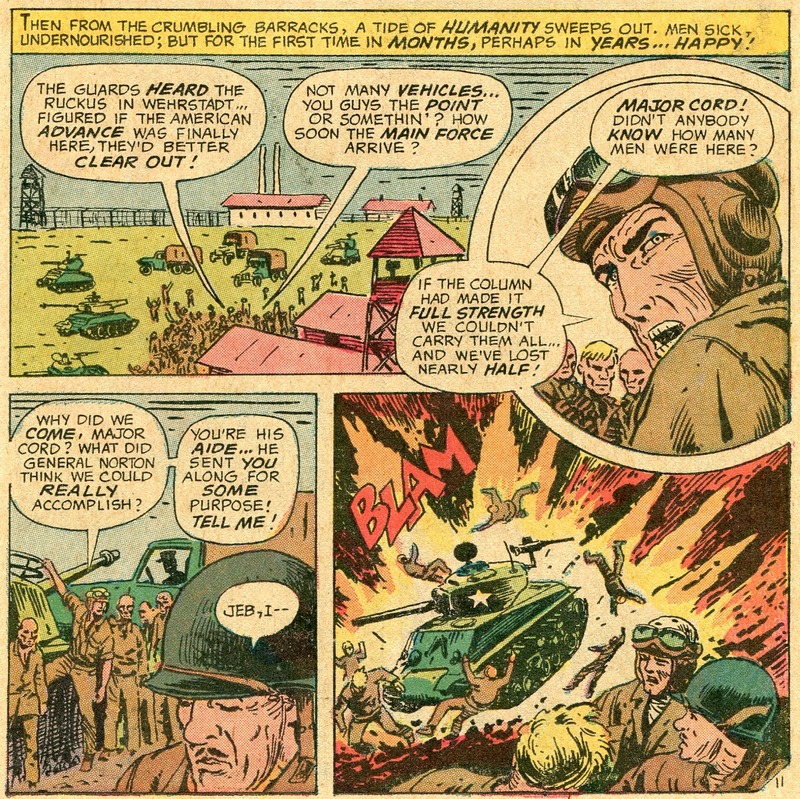 Goodwin himself took over as writer on G.I. 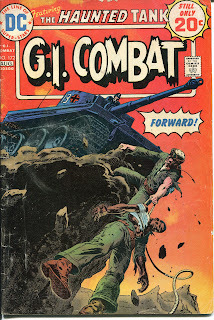 Combat (the home of the Haunted Tank) for about a year and a half, with Sam Glanzman doing the art. 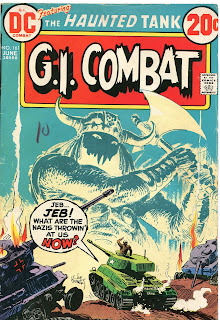 By this time, the old Stuart tank had been destroyed and Jeb was commanding a bigger tank built from the scraps of armored vehicles that had been lost in combat. Things go from bad to worse. The mission is a failure and the Haunted Tank ends up trapped behind enemy lines, forced to run east away from their own lines to avoid the Germans, raiding fuel depots along the way to get the diesel they need to keep going. They are joined by Gus Gray, an escapee from the prison camp and a former Olympic athlete. Another “prisoner” turns out to be a German spy. They narrowly escape one attempt to trap them only to roll into another, this time led by a German officer who is haunted by the ghost of an ancient Goth warrior. One of the crew is killed saving the others, while General Stuart and the Goth battle sword against axe in the sky above them all. 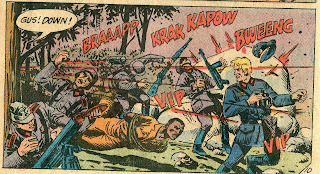 The whole multi-issue arc turns into an Odyssey for the Haunted Tank, as they fight or sneak their way into Yugoslavia. They make it to a port, where a Greek cargo ship takes them on, only to have the ship’s captain enlist their aid in his obsession to hunt down a particular German U-Boat. Finally, they are shipwrecked on a Greek island and captured by a German officer with a grudge against Gus, who beat him out for a gold medal at the ’36 Olympics. When the Haunted Tank manages to make it to Allied lines inside Italy, Jeb falls in love, watches his love die when she steps on a land mine and becomes involved in a cycle of revenge with the German officer who planted the mine field. Despite the inherent unreality of a lone tank fighting its way across German-occupied Europe, the entire epic is very solidly plotted. 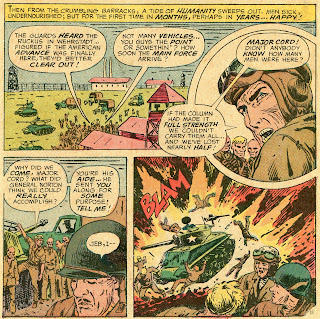 The action scenes are extremely intense and it’s all helped along by Glanzman’s realistic portrayal of vehicles and equipment. 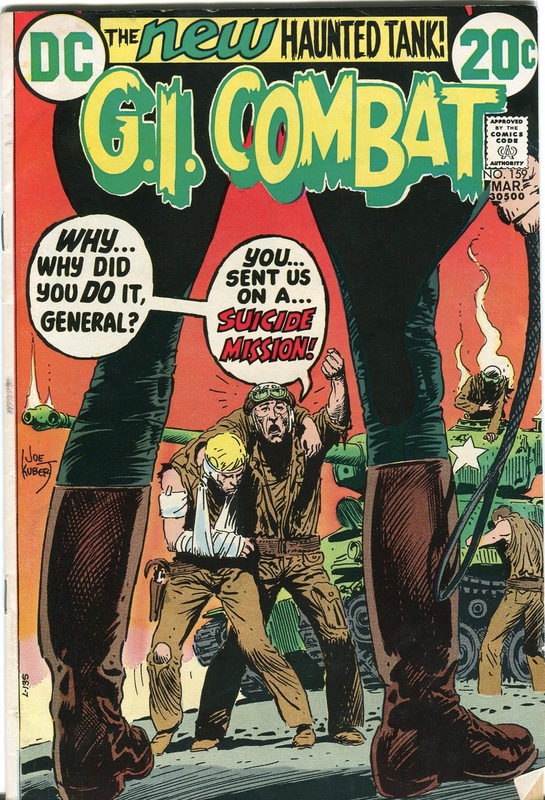 Goodwin was an excellent writer and borrowed Kanigher’s characters just long enough to construct a truly epic war story. It deals effectively with issues like loyalty, duty, revenge and honor, all without ever losing sight of the need to entertain the reader. His prose sounded like poetry. Show the Monster or Don't Show the Monster? Who the Heck is Dev-em?